Amid sparring over territorial disputes in the east and south China seas, China and the United States will hold the 15th annual Defense Consultative Talks in mid-October in Washington, the Chinese defense ministry spokesman has announced. Deputy Chief of the General Staff of the Chinese People’s Liberation Army Wang Guanzhong will co-chair the talks with US Under Secretary of Defense Christine E. Wormuth. “The strategic planning departments of the two militaries will hold their first dialogue during the talks,” Chinese Defence Ministry spokesperson Geng Yansheng said in Beijing. “We hope that the US side can carefully reflect – if they really hope for the Pacific Ocean to be peaceful, what kind of role do they actually want to play?” China’s Foreign Ministry spokeswoman Hua Chunying said in May this year reacting to US Secretary of State John Kerry comments that recent Chinese moves in the South China Sea were “provocative”. 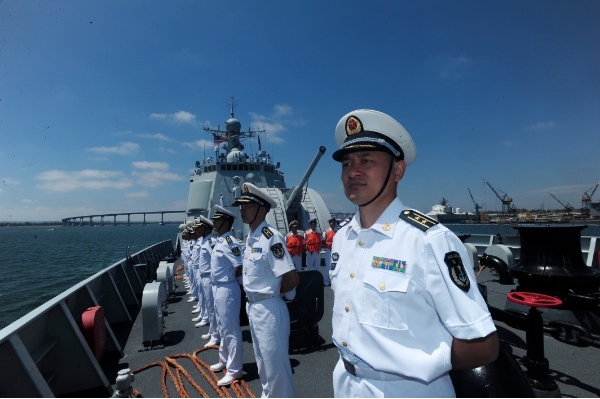 The presidents of China and the United States agreed on establishing the annual defence talks during their meeting in California in June last year. The two sides have met once in this format in Beijing in September last year. Meanwhile, US President Barack Obama in his address to the UN General Assembly on Tuesday reasserted his administration’s seriousness in the proposed “Asia Pivot”. “America is and will continue to be a Pacific power, promoting peace, stability, and the free flow of commerce among nations. But we will insist that all nations abide by the rules of the road, and resolve their territorial disputes peacefully, consistent with international law. That’s how the Asia-Pacific has grown. And that’s the only way to protect this progress going forward,” said Obama. Earlier in August this year, China asked the US to stop frequent surveillance flights intended to closely watch the Chinese territory after Washington accused a Chinese jet of veering too close to a US surveillance plane. China has said the US needs to create a plausible atmosphere for the development of bilateral ties even as tensions persist in the South China Sea, one of the world’s busiest shipping lanes. Beijing has repeatedly cast aspersions on US moves to “provoke” tension in the region by supporting its regional allies, Japan, Vietnam and the Philippines. China claims about 90 per cent of the South China Sea, although Vietnam and Philippines also lay contesting claims to parts into the maritime heart of Southeast Asia. Media reports have said the Obama-administration is soon set to lift a decades old arms embargo on Vietnam to “deal with growing naval challenges from China”. In an effort to assuage hurt relations between the two countries for months, Vietnam had sent a special envoy on a China visit in August aimed at discussing measures to relieve tensions. In what could be a major breakthrough in resolving one of the worst breakdowns in relations between the two Communist states, Vietnam last month also decided to compensate the victims of the anti-China protests in May.